First-year student Morven Ross has seen off stiff competition from 1,500 hopefuls in the Herbert Smith Freehills’ (HSF) ‘Connect With Us’ competition, to win an all-expenses paid 2-week trip to Australia. Originally from Glasgow, the 2017 University of Edinburgh veterinary medicine graduate who is now studying law at Queen’s made it through to the last eight for the final at HSF’s London office earlier this month. Morven’s trip down under will give her not only the chance to network with lawyers in HSF’s Sydney and Melbourne offices but also the opportunity to take in the sights in two of the world’s top cities. Posting on her Facebook page, Morven said: “Absolutely thrilled to say that I will be representing Herbert Smith Freehills in Australia this summer as the winner of their ‘Connect with Us’ competition. “It has been the most surreal experience and I have already met some absolutely amazing people. Throwing herself into life at Queen’s over the last 8 months, Morven is a member of the University’s Law Society, a volunteer tutor for the Students’ Union Homework Clubs programme, Treasurer of the Alternative Dispute Resolution Society and an energetic fundraiser for RAG (Raise & Give). During her time at Queen’s Morven also took part in Innovateher – a unique, extra-curricular, enterprise support programme for a select few female students at Queen’s to encourage entrepreneurial thinking. To secure the top prize, Morven had to undertake a multiple-choice quiz to demonstrate how much she knew about HSF, record a 60-second video to show how she was connected, and has given something back, to her local community, and finally, give a creative presentation to a panel of HSF lawyers and graduate recruitment staff showing how she would promote the firm’s brand while in Australia. As part of an amusing legal meme-filled presentation at the final, Morven suggested a treasure hunt with a clue shared across the HSF network every few days to push the company’s brand down under. 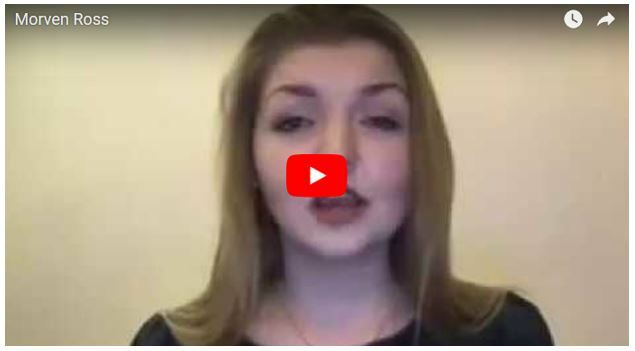 Talking to Legal Cheek, a UK news website for the legal profession, she said: “I’m definitely going to try to connect with all the finalists before I leave and I’d love for them to feel as if they can join me on my journey. Speaking about the competition, judge and HSF partner Rachel Lidgate said: “We’re really proud of all the finalists — they came up with some really bold and innovative ideas. Morven’s success showed she had the strong communication skills, the ability to connect with people from all walks of life, and a close involvement with her (new found) local community, that HSF were looking for. In 2016, Queen’s announced a partnership with Herbert Smith Freehills, which sees the firm sponsor the Student Hub in the University's School of Law building – and undertake a number of other student facing initiatives for a period of five years. Last August, HSF welcomed its first two summer interns from Queen's to its Belfast office.